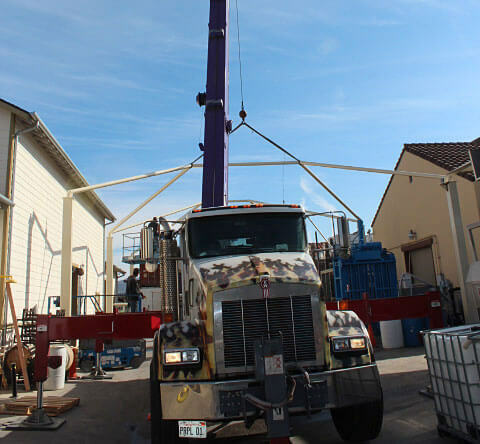 At Purple Crane, we have thirty years of experience performing expert crane lifts for the power and utilities industry in Southern California. Whether you need to install a new light pole or utility vault, or remove a damaged one, our experienced crane operators and hydraulic cranes get the job done accurately and efficiently. Our cranes and operators are available 24/7 to perform lifts for any utility installation or removal project. We can lift emergency generators, utility vaults, light poles, switch boxes, street poles, and large piping. We also have trucks and trailers available to transport the lifted object if needed: we can perform lifting to assist with removal and installation at each location, and provide transportation in between. Our knowledgeable staff is available by phone 24 hours a day, 7 days a week, and they can help determine the best crane for your project. We can handle any utility lifting job, from light- to heavy-duty loads: our state-of-the-art cranes range from 3-ton to 75-ton capacity and can reach as high as 165 feet. By providing the right crane the first time, we'll save you time, money, and hassle, and help ensure that your project runs smoothly. Call Purple Crane today to find out more about crane rental for Southern California utility projects. We are OSHA compliant and fully insured, and we can obtain same-day insurance certificates whenever needed.